BAR HARBOR, MAINE — The MDI Biological Laboratory has announced that Life Biosciences, a biotech company co-founded by David Sinclair, Ph.D., a leading researcher on aging and age-related diseases, has contributed $100,000 to fund its biomedical innovation course on aging. Other sponsors of the recent course, Comparative and Experimental Approaches to Aging Biology Research, included the Glenn Foundation for Medical Research and the Gerontological Society of America. The intensive, two-week course attracted graduate and post-doctoral students from around the globe to the coast of Maine to study the latest advances in the biology of aging with the leaders in the field, and to gain hands-on experience in working with the techniques and laboratory models used to study aging. The course emphasized the advantages of various model animal systems for addressing mechanisms relevant to the field. The participants engaged in hypothesis-driven research utilizing experimental methods including CRISPR, mRNA translation profiling, microinjection of animal models, quantitative fluorescence microscopy (QFM) and health/survival assays. The course also featured a “Live Longer, Live Better” lecture series for the public, which included a talk by Sinclair, who, in addition to being co-founder and chairman of Life Biosciences, is also a professor at Harvard Medical School and co-director of the Paul F. Glenn Center for the Biological Mechanisms of Aging. 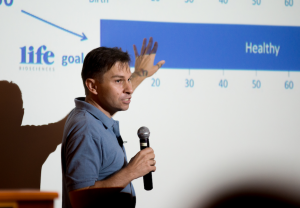 The aim of the lecture series was to bridge the gap between the public’s perception of how close science is to being able to extend healthy lifespan, and what is really occurring. The speakers described many therapies now under development for extending lifespan and delaying the onset of the age-related degenerative diseases. The series is available for viewing on the MDI Biological Laboratory’s YouTube channel. The course, which was first held in 2016, is an outgrowth of the MDI Biological Laboratory’s mission to extend healthy lifespan by developing new therapies to prevent or repair damage due to age-related degenerative diseases such as Alzheimer’s, cancer, diabetes and heart disease. Life Biosciences is focused on extending “healthspan” — or the period of life spent in good health — by researching the eight components of aging in order to delay or reverse them. The Boston-based company, described by Sinclair as a “Manhattan Project” for aging, serves as an investment platform for a group of early-stage biotech companies focused on these critical components. The course represents a natural link between the scientists at Life Biosciences, who are at the forefront of aging research, and the next generation of aging biology scientists, who will continue to build on the rapidly accelerating body of knowledge in the field, he added. Life Biosciences’ mission is to improve and extend lives by treating aging as a disease and unleashing untapped human potential around the world. We empower scientists to develop drugs and treatments that promote longer, healthier lives. For more information, please visit lifebiosciences.com/.